There are nifty portable cribs for babies but I never knew there were nifty portable bunk beds for kids too! 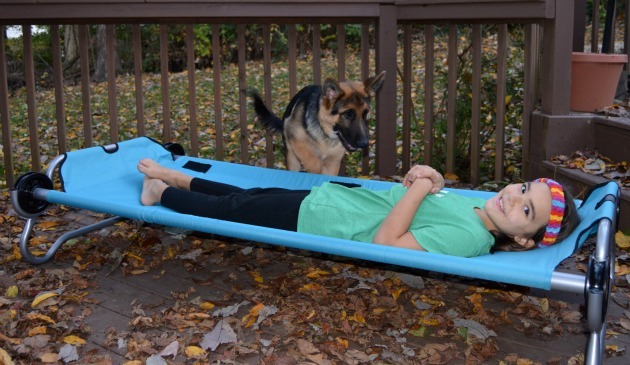 If you have ever been in a pinch for sleeping space for kids, whether when relatives come into town, kids sleepover, or you go camping, you will love this easy solution! This post is brought to you by Kid-O-Bunk but all opinions expressed are my own. 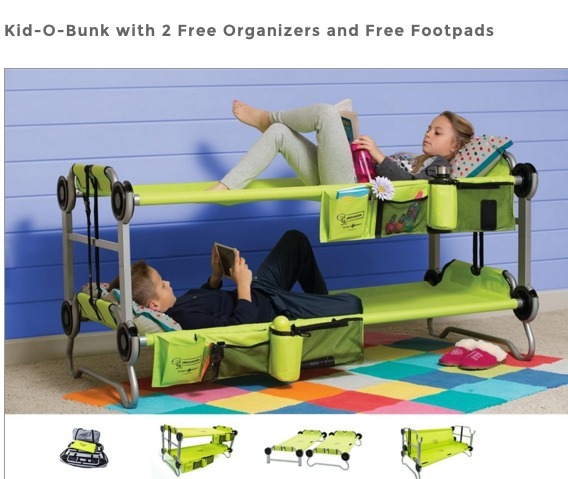 Kid-O-Bunk is a nifty piece of portable furniture that can be used as a bunk bed, two single beds, or a couch/bench. There are zero tools required for assembly and there are no air mattresses involved which means you don’t have to worry about popping or deflating as you sleep. The patented lock-in disc system offers a sleeping solution that is easy to assemble, easy to store, and super handy to have and use in many different ways. 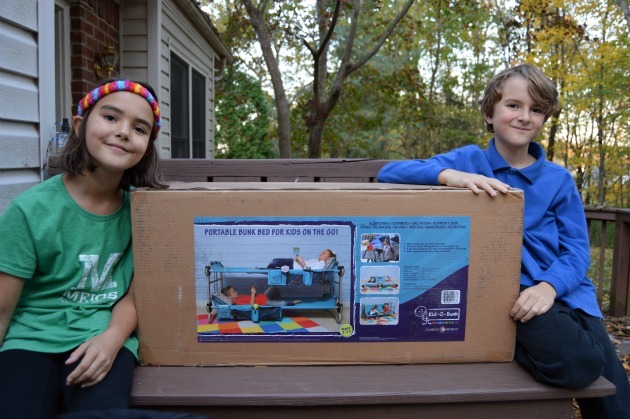 This portable bunk bed sleeping solution for kids uses machine-washable polyester as the sleeping deck so it conforms to the child’s body shape for contoured comfort and is made durable to prevent ripping or tearing. My German shepherd tested this out with his super sharp claws multiple times because he loves climbing on the Kid-O-Bunk and taking a nap- he can’t let the kids have all the fun without him! Equipped to handle any outdoor adventure, the steel frame adjusts to uneven ground with a weight tolerance of 200 pounds per single cot. We tested that out too! They are very sturdy. 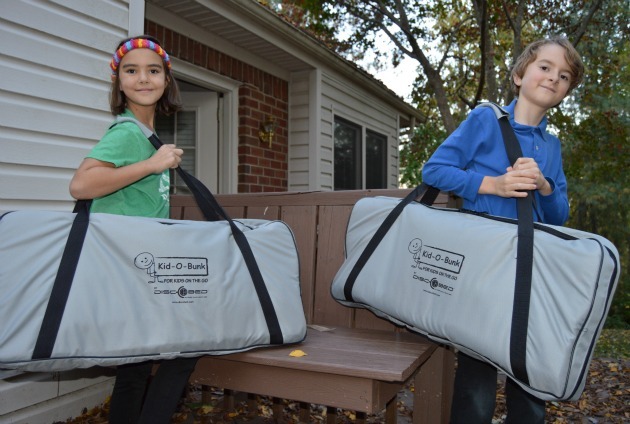 Kid-O-Bunk comes in one cardboard box which is fairly heavy but inside the beds are packaged in individual, zippered carry cases that are easy to handle. The beds come with matching side organizers that make quick and neat storage of personal belongings a breeze. The Kid-O-Bunk is easy to assemble. 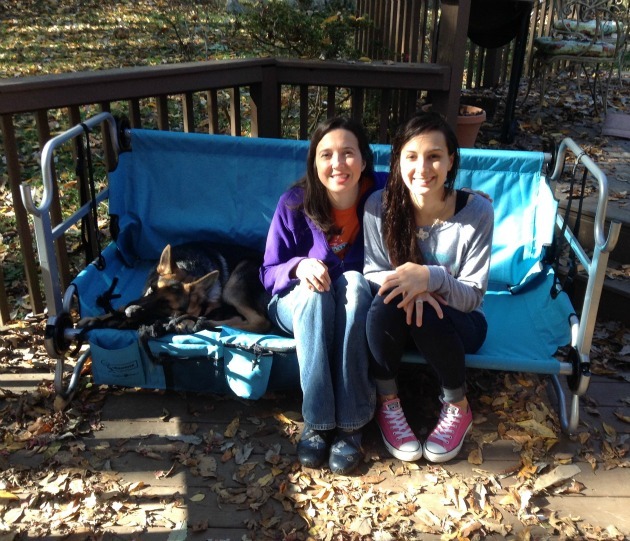 My daughter and I worked together to assemble the individual cots first. There are basically three thick poles that fit together and lock into the circle part of the end pieces. You can then slide the canvas cover over the poles and lock into the other circle part of the end pieces. Securing the foot rest and the head rest with the strong velcro pieces makes the cot sturdy and ready to use individually. You can also add on the included organizers which come in handy for a bedtime drink, flashlight, or book. The cots are perfect size for a sleeping bag. 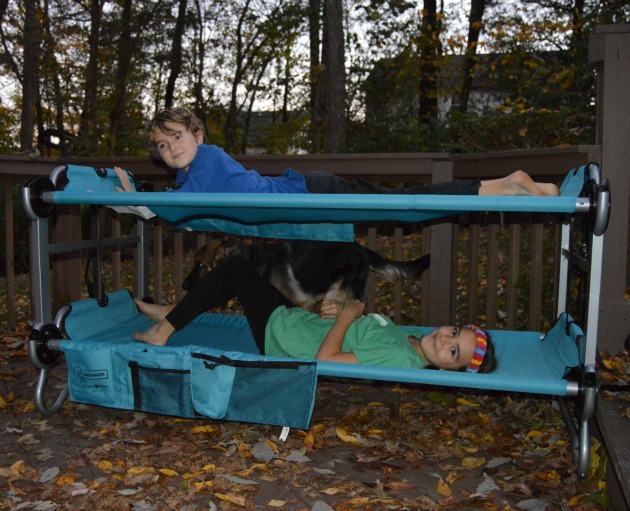 The two individual kid cots can be stacked with a few simple modifications into a portable bunk bed. This is great if you have a small bedroom and a big sleepover party. 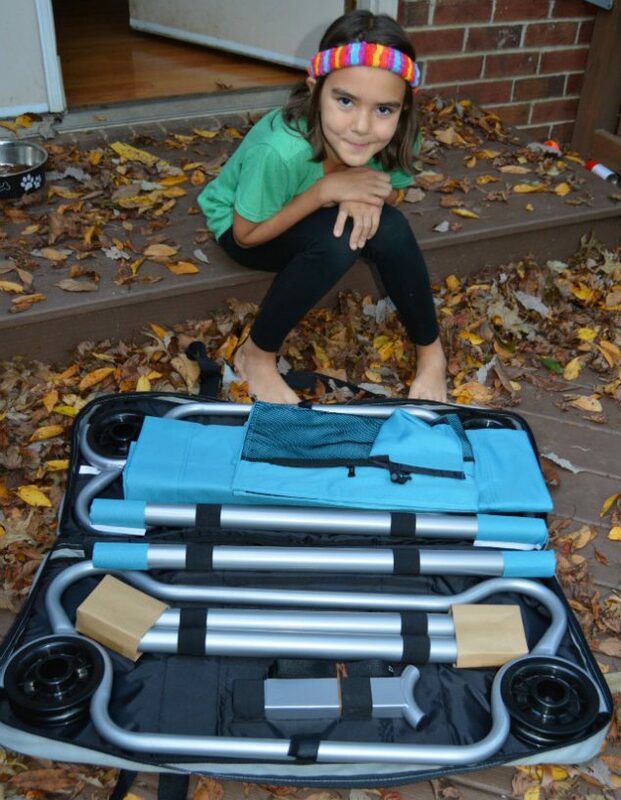 It is also invaluable in creating some living/ moving space inside your family tent. We go camping a few times of year and we are so excited to use our Kid-O-Bunk to create more space and to not have to worry about holes in our inflatable mattresses. You can easily convert the bunk bed into a couch. Kid-O-Bunk calls it a bench but I see it more as a couch- same difference really. Either way it makes for convenient extra seating in the playroom during a playdate or in the tent for a game of cards. My niece and I tested it out on my porch. I made this short little video to show you how easily it configures from a portable bunk bed to a couch. The Kid-O-Bunk is available in teal or lime green. You can learn more or purchase the Kid-O-Bunk at kidobunk.com in addition to most major retailers. So which feature of Kid-O-Bunk do you love the most? Is it no-tool assembly, bunk bed, sitting bench or two single cots? Do you wish you had some easy sleeping solution for the kids when they have sleepovers, guests are in town or you go camping? This is really making me want to go camping. My kids would love these. Looks like you are enjoying some great fall weather. This is totally awesome. I’ve never seen these before, but now I want a set for my kids. It would make life a lot easier for my inlaws for sure. These beds look so fun! I’m sure most children would absolutely love these! I like the green one with the organizers. These cots look like just what we need for camping. Our cots are such a hassle to set up. And, I love that these are stackable–a real space saver in the cramped quarters of the tent. Well I’ll be! I used to have to sleep on a camp cot as my asthma would act up if I didn’t. But I’ve never seen bunks – how fabulous for saving space, and quite a novelty for the kids. I love the dual-purpose with the sofa as well – if you’re going to sleep in style, why would you want to sit on the ground during the day? Nice Post on space saving and functional bunk beds. I like Free Shipping.